bDepartment of Psychiatry and Psychotherapy (D.H.), University of Cologne, Cologne, Germany. SUMMARY: There has been a recent upsurge of reports about applications of pattern-recognition techniques from the field of machine learning to functional MR imaging data as a diagnostic tool for systemic brain disease or psychiatric disorders. Entities studied include depression, schizophrenia, attention deficit hyperactivity disorder, and neurodegenerative disorders like Alzheimer dementia. We review these recent studies which—despite the optimism from some articles—predominantly constitute explorative efforts at the proof-of-concept level. There is some evidence that, in particular, support vector machines seem to be promising. However, the field is still far from real clinical application, and much work has to be done regarding data preprocessing, model optimization, and validation. Reporting standards are proposed to facilitate future meta-analyses or systematic reviews. In the case of intertrial variability in individual subjects, the problem of differentiating single trials has been overcome in recent years by the rise of multivariate supervised learning methods derived from the fields of machine learning and pattern recognition. Such methods, often termed multivariate or multivoxel pattern analyses (MVPAs), are increasingly adopted in psychologically motivated fMRI studies. The concept of such analyses is that at first an algorithm is used to derive a decision rule (classifier) on the basis of a set of labeled training data (eg, comprising ≥2 classes; eg, different stimuli categories or tasks). This rule is applied to classifying an independent set of test data as belonging to one of these classes in a second step. A general overview of this approach is shown in Fig 1. In contrast to conventional analyses, these techniques are based on patterns of brain activation or connections not on individual regions or voxels.18⇓–20 Recently this concept has been extended to classifying individual subjects with a diagnostic purpose (for earlier, methodologically oriented reviews see Kloppel et al21 and Orrù et al22). This article gives a comprehensive overview of MVPA applications to fMRI from a more clinical, particularly neuroradiologic, point of view. Illustration of the diagnostic workflow and data-processing pipeline proposed by most of the studies reviewed here. Although there are a large number of supervised machine-learning techniques that can, in principle, be applied in this context,23 2 groups of methodologies are of particular importance: support vector machines (SVMs) and linear discriminant analyses (LDAs). In SVMs, the classification problem is operationalized as defining a hyperplane that best distinguishes groups of subjects. The classifier is trained by using a kernel by maximizing the margin of separation between 2 groups on the basis of the examples closest to the separating hyperplane.22⇓–24 In a typical LDA variant, all data points are projected to a 1D space with the aim of maximizing intergroup separation and minimizing intraclass variation.22,23 LDA and support vector machines are very heterogeneous groups, depending on the actual operationalization or the kernel used. Certain kinds of SVMs are mathematically very similar to certain types of LDAs, while there can be important differences between different support vector machine formulations and parameter sets.23 The distinction made is, therefore, somewhat artificial. An issue that has to be overcome in diagnostic classification is interindividual structural variability regarding the morphology of the cerebral sulci and gyri as well as their relation to histologically and functionally relevant brain areas.25 Within-subject MVPA analyses often rely on fine-grained patterns on a single-voxel level.18,19 In contrast, most diagnostic MVPA studies reviewed here focus on another spatial scale: larger functionally coherent brain areas. There has recently been a remarkable upsurge of scientific articles from the interdisciplinary functional neuroimaging community reporting successful applications of MVPA on fMRI data to various diagnostic problems, especially in the past 3 years. This constitutes a paradigm shift from comparative univariate to discriminative multivariate analyses of fMRI data. An exhaustive overview of these previous studies by using either task-based26⇓⇓⇓⇓⇓⇓⇓⇓⇓⇓⇓⇓⇓⇓⇓⇓⇓⇓⇓⇓⇓⇓⇓⇓⇓⇓⇓⇓⇓⇓⇓⇓⇓⇓⇓⇓–63 or task-free55,64⇓⇓⇓⇓⇓⇓⇓⇓⇓⇓⇓⇓⇓⇓⇓⇓⇓⇓⇓⇓⇓⇓⇓⇓⇓⇓⇓⇓⇓⇓⇓⇓–97 fMRI is given in On-line Tables 1 and 2. An overview of particularly reliable studies with above-average statistical power is presented in Fig 2. 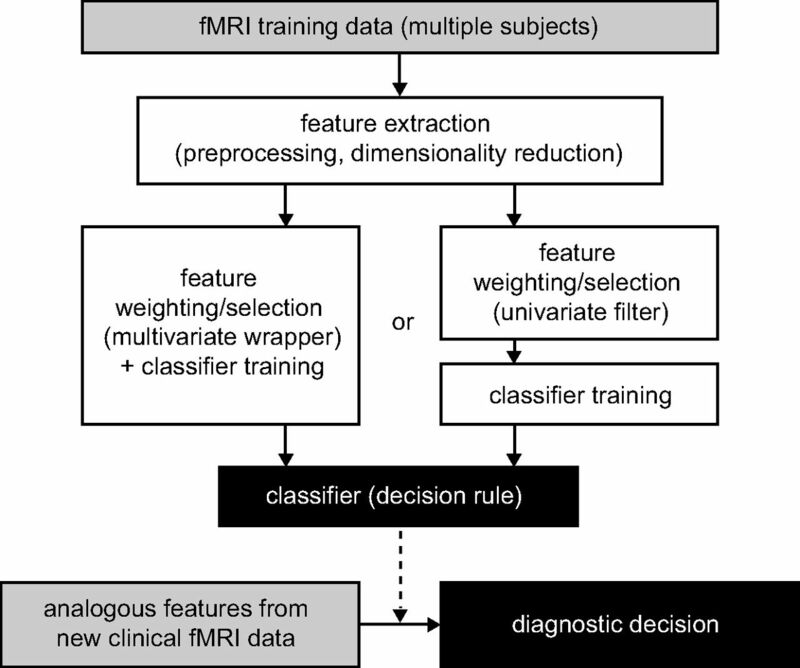 Overview of MVPA-based diagnostic fMRI studies with an above-average statistical power to detect successful models (n ≥ 25 in every group of the training set; group size ratio ≤ 1.2 as a prerequisite for comparing the overall classification accuracies reported).34,43,45,55,61,72,74,85,95 Symbol sizes represent average group sizes in the respective study. a, Only minimum and maximum classification accuracies are shown here. b, Study of cross-validation findings also reports results in a smaller independent validation set. c, Only Gaussian process classifier overall accuracy is shown here. d, High overlap with another study is not shown here. FS indicates feature selection. For a complete list of studies, see On-line Tables 1 and 2. Although they are promising at first glance, there is a high degree of methodologic heterogeneity of classification algorithms and data-preprocessing steps in these studies. Some of the reported results seem to be mostly add-ons to studies whose designs were primarily aimed at clarifying disease mechanisms or were focused on computational aspects, not primarily done with the aim of developing a diagnostic tool. Until now, no single effort in this field has provided sufficient large-scale validation and systematic optimization of methodologic choices leading to an application in a real medical diagnostic setting. Due to this heterogeneity and because strategies to assess the statistical significance of diagnostic accuracy vary considerably between studies, we did not perform a formal meta-analytical comparison of these reports. By now a majority of reported approaches are based on conventional task-based fMRI.26⇓⇓⇓⇓⇓⇓⇓⇓⇓⇓⇓⇓⇓⇓⇓⇓⇓⇓⇓⇓⇓⇓⇓⇓⇓⇓⇓⇓⇓⇓⇓⇓⇓⇓⇓⇓–63 This means that patients have to perform a specific, mainly neuropsychological task in the MR imaging scanner. Statistical models are designed to evaluate the amount of variance in the acquired EPI data caused by this task modification of brain activity. This corresponds to “brain activation” in conventional fMRI studies.1 An advantage of this approach is a rather straightforward functional interpretability of such data. Yet in addition to mainly psychologically motivated studies in young healthy participants, patients' adherence to task instructions constitutes an important source of variability in real clinical settings and may even interfere with diagnostic decision-making. Recent further developments in diagnostic MVPA are not solely based on one of these methods. For example, Du et al55 combined both task- and task-free fMRI in schizophrenia in a small study. Additionally, combinations of fMRI measures with volumetric data,41,48⇓–50,63,76,78⇓⇓–81,86,89 DTI,46,49,92 as well as genetics42 and behavioral data,40,41,50,76 have been used as features in MVPA analyses. However, results reported so far do not allow verified statements about the benefit of such multimodal acquisitions. Feature Selection, Classifier Training, and Assessment of Classification Accuracy. Figure 2 and On-line Tables 1 and 2 contain information about the multivariate classification methods in the studies included in this review. They also contain information about whether the selection of potentially decisive features was based on conventional univariate analyses or whether it was also guided by multivariate information of distributed network patterns. Apparently there are 2 groups of actual classification methods that have been applied successfully repeatedly: variants of LDA26,53,59,61,65⇓–67,70,73,79,81,82,94 and support vector machines.35,36,38,40⇓⇓⇓⇓⇓⇓⇓⇓–49,51,52,54,58,60,62,67⇓⇓⇓–71,74⇓⇓⇓–78,80,81,83⇓–85,88⇓–90,92,93,95⇓–97 Although a certain number of articles report on conceptually different machine-learning techniques27⇓⇓⇓⇓⇓⇓–34,37,39,41,45,48,50,53⇓⇓⇓–57,62,64,67,70,72,86⇓–88,91 (eg, neural networks31,39,64,67,70 and decision tree–based approaches41,50,81,86,87,91), each has only been applied occasionally, making reliable conclusions about their specific benefits and drawbacks in this context practically impossible. To this point, most studies report applications to distinguish healthy controls and patients with a specific disease. These are a necessary step in developing and accessing diagnostic tools, but is it currently really clinically desirable to strive for such a tool? In this context, specific features of most psychiatric diseases should be taken into account when discussing the results of these analyses: The etiology and progression of disease are complex and only partly attributable to biologic causes. The biopsychosocial model of pathogenesis includes major influences of social and life event–related factors105,106 that do not necessarily lead to correlates that are approachable by biologic measures such as fMRI.107 Furthermore, many diagnostically relevant symptoms are, by definition, subjective (eg, depressed mood).108 The burden of suffering is often decisive in terms of indications for treatment.109 Therefore, fMRI-MVPA–based measures should not be expected to become the criterion standard in diagnostics and replace in-depth history-taking. The accuracies of the studies reviewed here support this theoretic argument. Still, imaging-based multivariate tools might be able to provide clinically useful additional information: When important information (eg, regarding prognosis) is, by definition, not deducible from the course of disease, these tools might provide the clinician with crucial hints,7 unraveling the “biologic share” of disease. As seen in Fig 2 and On-line Table 1, MVPA-fMRI has already been applied to a larger number of psychiatric disease entities. For depression,35,36,38,45,47,48,54,57,68,350 schizophrenia,26,32⇓–34,37,39,42⇓–44,55,58,61,62,64,66,70,74,90,91,96 and Alzheimer dementia,26,27,41,50,53,65,71,73,79,82,94 there is now a larger body of independent work. The diversity of scientific backgrounds of recent studies is reflected by a striking heterogeneity of reported methodologic details, sample characteristics, validation strategies, and performance measures. This heterogeneity limits effort to draw more reliable quantitative conclusions about the clinical benefits of MVPA-fMRI at this stage. More specifically designed studies with a sufficiently high statistical power and confounding factors of a real clinical setting in mind with a more standardized diagnostic end point should be performed to facilitate meta-analytic comparisons in the future. As a stimulus for further debate, we propose reporting standards and standards of study design that, in our opinion, may help overcome some of these issues. They are summarized in the Table. Before MVPA-fMRI could be applied in real clinical settings, potential interscanner variability113 should also be taken into account. Approximately 70 studies at the proof-of-principle level that use MVPA of fMRI data with a diagnostic intention have been reported. However, there is wide range of different methodologic decisions, from data-acquisition strategies through preprocessing and feature selection to actual diagnostic classification algorithms and parameter settings and, therefore, a high flexibility in study design. Results reported as yet are mainly based on small sets of subjects. Therefore, one has to be cautious in drawing reliable conclusions on the basis of this literature. Published results may just represent the tip of the iceberg, with a lot more unsuccessful unpublished attempts to apply this methodology. 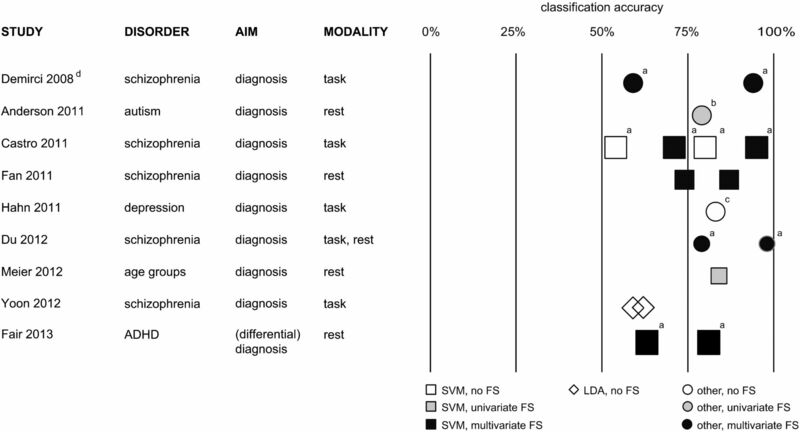 Therefore, there might be an important publication bias, and published results regarding the statistical significance of successful diagnostic classification should be interpreted in the light of a potential need to correct for multiple comparisons.114 Nevertheless, it can be regarded meanwhile as an independently replicated finding that building on task-based and resting-state fMRI as well support vector machines as LDA approaches has the potential to differentiate patients from healthy subjects in psychiatric disorders with most repeated findings in dementia, schizophrenia, and depression. In contrast, there is apparently more uncertainty regarding optimal strategies for data preprocessing and feature selection, advisable steps to allow the classification algorithm to work despite a very high dimensionality and noise level of the original data. Many of these methods are derived from conventional fMRI analysis methods. Hardly any effort seems to have been made to systematically compare and evaluate the influence of these different approaches and parameter-setting selections on diagnostic accuracy. In conclusion, here is some evidence that MVPA-fMRI is promising for overcoming long-known reliability issues in fMRI and providing clinically important prognostic and differential diagnostic information in psychiatric disorders beyond pure exclusion of gross structural alterations. Despite the optimism coming from the recent discussion in the interdisciplinary functional neuroimaging community, this method is still rather new, and work has to be done to validate methodologic choices and identify those specific clinical settings that really allow a beneficial application. Moreover, a conceivable integration of MVPA-based fMRI into clinical workflow will depend critically on tackling diagnostic problems with a real clinical benefit and effects on therapeutic decision-making. Disclosures: Wolfram Schwindt—UNRELATED: payment for manuscript preparation: RöFo (Executive Editor). Accepted after revision June 19, 2013.